Having just closed the first year using my Unibody MacBook, I still have plenty of free space on the stock 160 GB hard drive, including 40+ GB of free space on a nearly empty partition on which I'm planning to install OS X 10.6 Snow Leopard, which I got around to ordering last week because I finally encountered a software application that I need to review that requires Snow Leopard. I plan to continue using OS X 10.5 Leopard as my production system until Unsanity Software (hopefully) gets a Snow Leopard compatible version of WindowShade X out the door. Anyway, I consequently haven't got much incentive to upgrade to a larger capacity drive, but then I don't have much in the way of movie content stored - or either large photo or music collections. I do have 500 GB, 1 TB, and 2 TB external hard drives to handle any excess storage capacity I might need in the foreseeable future, as well as regular data backups. In the meantime, that "little" 160 GB drive remains whisper-quiet after a year of intensive use, which is much in its favor. However, if you find yourself hankering after a lot of onboard data capacity, two California-based Mac service and repair firms recently announced 1 terabyte (TB) MacBook Pro and MacBook hard drive upgrade packages that should accommodate your needs, and, of course, especially with the unibody models, do-it-yourself hard drive upgrades are an option. TechRestore Inc. offers what they claim to be the first 1 TB drive upgrade service for MacBook and MacBook Pro systems that includes same-day and overnight installation, data transfer, and free shipping. The upgrade uses the new Western Digital Scorpio Blue 1 TB laptop drive and is compatible with 13" and 15" MacBook and MacBook Pro Unibody systems as well as original 17" MacBook Pro models. TechRestore's same-day and overnight hard drive upgrade service includes installation of the new drive into the user's computer by an Apple certified technician, data transfer from the old hard drive onto the new drive, and return shipping. Optionally, the old hard drive can be installed in an external enclosure to use for Time Machine backups and data overflow. Nationwide door-to-door pickup service is available for the upgrade - or local pickup from more than 4,000 TechRestore local pickup centers throughout the US. Mac users in the San Francisco Bay Area can drop off their 'Books at TechRestore's repair center in Concord. The upgrade package is available now at $329. Another California outfit, Santa Clara based MyService, has also announced a new 1 TB hard drive upgrade service for MacBook Pro and unibody MacBooks using the WD Scorpio Blue drives, currently the largest-capacity 2.5" drives available. MyService's upgrade package includes the new drive, round-trip shipping, installation, and data transfer. MyService sends out a custom shipping container, all shipping is insured and can be tracked online. The complete upgrade service costs $345. MyService is an Apple Authorized Service Provider, so the 1 TB upgrade won't void your Apple warranty. These drives are slightly higher-profile than standard 2.5" drives, but they still fit comfortably in all Unibody MacBook Pros, the 13" Unibody MacBook and the 17" (Silver Keyboard) MacBook Pro. When the shipping container arrives, pack your 'Book in it and return it using the prepaid UPS shipping label. You can drop off your laptop at any one of the 4,200 UPS Store locations within the United States. 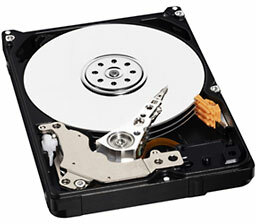 A certified technician installs the new drive and transfers data from your old drive. If your old hard drive is failing, a new operating system is installed. Drives feature a 3 year manufacturer warranty. Your laptop is cleaned, tested, and returned, along with your old drive - all services to be completed within 24 hours of arrival. Swapping hard drives in all MacBooks and unibody MacBook Pros is pretty simple for anyone handy with a screwdriver and with a few minutes to spare (it's a bear, albeit still doable, for the skilled and determined, with old-school MacBook Pros - make sure to check out the iFixit teardown guide appropriate to your 'Book before proceeding), so do-it-yourselfers can save a few bucks by purchasing a Western Digital Scorpio Blue 1 TB 5200 RPM drive directly from resellers - or the just-announced competing 1 TB MKxx59GSM Series Hard Disk Drive from Toshiba. Other World Computing offers the 1 TB WD Scorpio for $219.99. The best price I've found so far (tip of the hat to my PowerBook Central colleague Joe Leo) is $178.90 (plus shipping) from Amazon.com. These 12.5mm high-profile 2.5" drives are supported by all Apple MacBook/MacBook Pro 'Unibody' Models (13/15/17"), plus the 17" 'pre-unibody' MacBook Pro, feature 8 MB of buffer cache, 12.0ms seek time, and use the KGB/s SATA interface. Scorpio Blue 2.5", 5200 RPM drive upgrades can also be had in 750 GB, 640 GB, 500 GB, 320 GB, 250 GB,and 160 GB capacities, and incorporate the company's proprietary WhisperDrive technology, enjoying a reputation as being among the quietest 2.5" hard drives on the market. WD explains they combine state-of-the-art seeking algorithms that optimize the way a drive seeks for data, which also significantly diminishes power consumption. 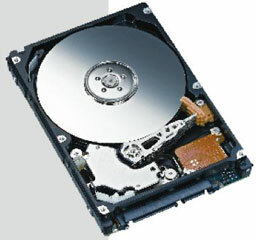 WD's ShockGuard technology protects drive mechanics and platter surfaces from shock damage, and the drives' SecurePark feature parks the recording heads off the disk surface during spin up, spin down, and when the drive is off, ensuring that the head never touches the disk surface, resulting in improved long-term reliability due to less head wear and improved non-operational shock tolerance. If you can struggle along with a mere 750 GB data capacity, Toshiba offers its MK7559GSXP 5400 RPM Serial ATA hard drive in a standard 2.5" hard drive form factor, as well as 750 GB and 1 TB Series MKxx59GSM 12.5mm high=profile 2.5" drives, which are supported by all Apple MacBook/MacBook Pro 'Unibody' Models (13/15/17"), plus the 17" 'pre-unibody' MacBook Pro. The MK7559GSXP is Energy Star compliant, and Toshiba's Advanced Sector Format technology uses industry-leading 4K byte-per-sector configuration and improved error-correcting code functionality to enhance data integrity, while making more efficient use of the storage surface area. Toshiba also claims to use internal components that reduce reliance on harmful chemicals, materials and compounds. Toshiba's new MKxx59GSM series of 2.5", 5400 RPM SATA hard drives deliver 750 GB and 1 TB storage capacities in a 12.5mm high package targeting today's massive digital content needs with capacity points typically supported by larger form factor 3.5" drives. New design elements of the MKxx59GSM series drive include Advanced Sector Format technology, which utilize the industry standard 4K byte-per-sector configuration and improved error-correcting code functionality to enhance data integrity while making more efficient use of the storage surface area. Toshiba also touts its environmental initiatives, including lower power consumption techniques and components that reduce reliance on harmful chemicals, materials and compounds that are also represented in the MKxx59GSM design.